My name is Nat, nice to “meet” you! 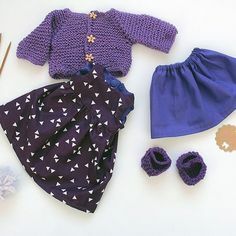 I live in germany and am a wife to my dear husband and mother to a toddler whose heart belongs to dollmaking and blogging. I began blogging on Kukalka in July 2014, when I was on parental leave and became a stay-at-home mom after having my son in 2013. 2017 I decided on a fresh relaunch for my brand and renamed my label to “Rosemint Dollstudio”. I guess I looked for a creative outlet and a counterweight to my everyday life. 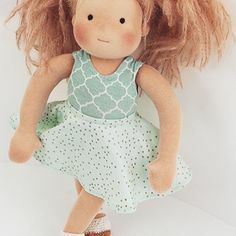 Making dolls and creative projects always makes me so happy and is something I need like the air I breath. From a very young age on I already knew I had to do something artistic and creative in my life. I always loved to draw and liked all sorts of art. I was eager to learn everything on a subject when I was interested and curious about something. Although I would have loved to make a living from my creativity, I was not brave enough to try it out. So I went to college studying art history and education science instead. I became a kindergarten teacher afterwards. And though I loved to work with little kids, I still knew I wanted to do even more. There was a streak of my personality urging to come to live. During my early years as a kindergarten teacher I got to work at a waldorf kindergarten. 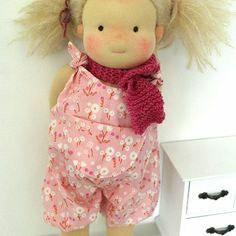 There was one very talented and kind older colleague educator who thought me all the waldorf crafts – I learned how to make dolls, needle- and wet felting and a lot about the waldorf art, craft and philosophy behind it. I loved it. My inspiration is my everyday life, my son, watching the kids play on the playground and of course books, art, music and the internet. 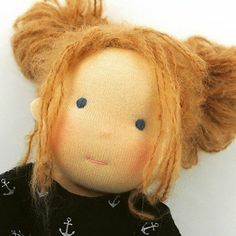 Dollmaking and all things DIY are a true passion for me. I put a lot of love and energy into everything I work on. Also I try to reach out to other people and create a positive environment and basic understanding for the diversity and different branches creativity and art may blossom into. Also I always love to interact and communicate about the common passion we share and this way learn new things from you, too. I usually write posts 2-3 times a week or whenever I feel the urge to share my thoughts or current creative projects. it only seemed appropriate that I would introduce myself in list-format. The best ways to connect with me are through the comments on my blog posts – I do my best to respond to each and every one. Facebook, Twitter, Pinterest, Instagram & Google+.